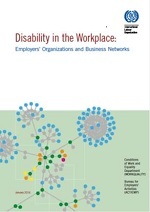 The first edition of the Disability in the Workplace: Employers’ Organizations and Business Networks was published in 2011 to share practices on how different business organizations support and promote employment of people with disabilities. In this publication, 14 organizations introduce and share their initiatives and practices on disability inclusion. The good practice examples demonstrate that national networks can be instrumental in promoting joint initiatives among companies, for instance in providing training to disabled job seekers in professions and skills that are in demand. Business and disability networks can also support a legislative and policy environment that is more conducive to the employment of persons with disabilities. 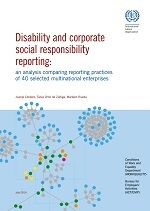 Disability and Corporate Social Responsibility reporting: an analysis comparing reporting practices of 40 selected multinational enterprises. Corporate Social Responsibility (CSR) has become an integral part of corporate strategy in recent years. It consists of a multifaceted approach that has an impact on both society and the company. It encompasses human rights and environmental issues, contributing to community development, all the while improving company reputation, brand image and corporate culture. To explore how companies are integrating disability into their CSR work, this publication investigates reporting practices of 40 multinational enterprises. In the context of a youth unemployment crisis, youth with specific disadvantages, such as having a disability, face even more barriers to decent work. 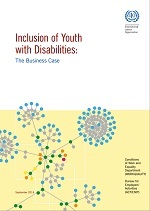 In light of this challenge, the ILO Global Business & Disability Network compiled a collection of positive examples from 10 companies of different sizes sectors and countries in their efforts to train or employ young people with disabilities. Each case study provides the reader with a short overview of how initiatives were set up and implemented, with practical tips and advice from managers to encourage replication of these examples of successful initiatives. The inclusion of people with disabilities in the workplace is no longer absent from the business agenda. Nonetheless, managers still struggle in implementing inclusion strategies effectively. 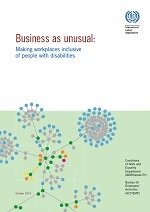 Based on examples from 15 multinational companies, employers’ organizations and business networks, this publication presents key factors leading to the successful inclusion of people with disabilities in the workplace. Divided into two main sections – the why and the how, it provides solutions and ideas on how to improve and expand existing practices, as well as guidance to those who wish to get started and take active part in transforming what it is still perceived as unusual into a natural component of the work environment.